If you ever live in another country this ESL driving vocabulary will be very useful. You will need to know how to talk about driving and travel, especially if you want to drive a car there. This page has a list of vocabulary items that you will need to learn and understand to be able to talk about driving. Each item also has a simple definition so you will know what the word means. 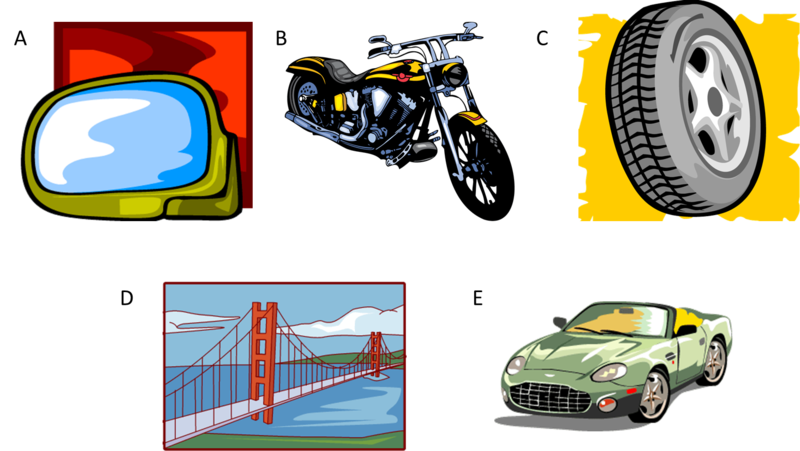 The travel and driving vocabulary has also been made into a set of flashcards with pictures for many of the items. You can download these to use at home to learn the words. After that, the vocabulary has been recorded while being spoken by a native English speaker so you can listen to the correct pronunciation. This is in two forms, either a basic form where you can just listen to the recording of the ESL driving vocabulary items or as a video where you can see the flashcards at the same time as listening to the items. Identify the correct definition of a word. Identify the correct meaning of a definition. Identify pictures of vocabulary items. The ESL driving vocabulary list that follows has all the vocabulary terms you need to learn. After the list there are some flashcards that you can download and print. Then there are recordings of the vocabulary items being spoken by a native English speaker so you can hear the correct pronunciation. 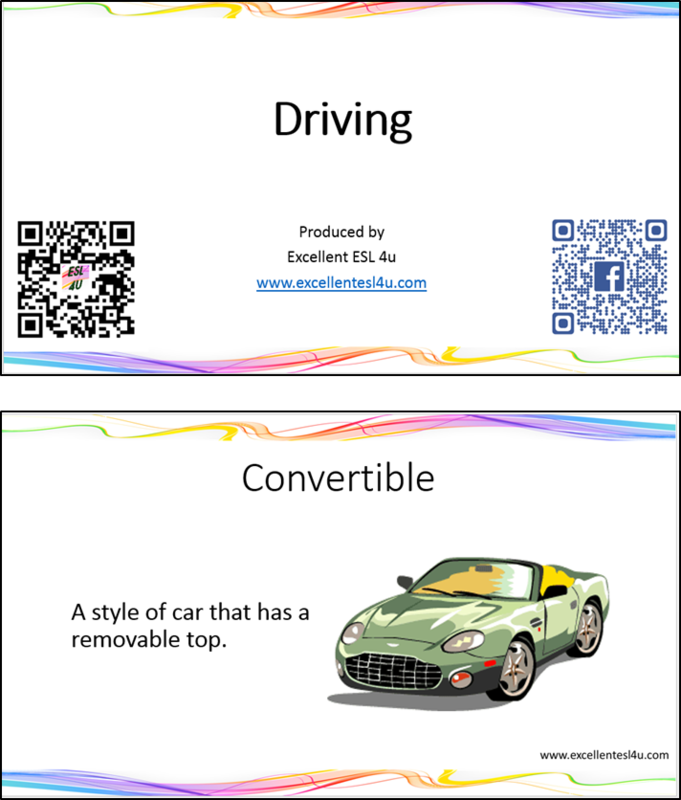 You can download and print the following free ESL driving vocabulary flashcards. Just click on the picture or link that follows. The following are the ESL driving vocabulary being spoken by a native English speaker so you can hear the correct pronunciation. Firstly there is just the basic recording that you can listen to, and after that there is a video of the flashcards for you to watch while listening to the recording. In this first ESL driving vocabulary task you need to decide which option (A-D) is the correct definition of the word given in the question. Once you have finished you can click the get score button to see the answers. Choose the correct definition for the driving vocabulary in this quiz. 1) What is the definition of Back seat? A) A special place for pedestrians to cross a road. B) The seat in the back of a car. C) A road that is built over an obstacle. D) A cloud that is on or a little above the ground. 2) What is the definition of Convertible? A) The special flashing lights on a car that drivers use when there is an emergency or danger. B) A place where more than one road meets (American English). C) When a tire loses all of its air. D) A style of car that has a removable roof. 3) What is the definition of Lanes? A) The strips of road with painted lines on both sides for vehicles to travel on. B) A special place to leave a vehicle. C) A metal plate with special numbers and letters that police can use to identify a car owner. They are usually located on the front and back of a vehicle. D) A kind of transportation that looks like a bicycle but has a motor. It has no doors or top. 4) What is the definition of Passenger? A) To park a car by moving it forward (usually into a parking space). B) A belt that crosses the body in the front to keep drivers and passengers safe. C) A person who travels in transportation (ex. car, airplane, bus) but does not control it. D) A place where the road crosses railroad tracks. 5) What is the definition of Speed limit? A) The fastest legal driving speed in an area. B) Black marks on a road made by tires when a vehicle stops too quickly. C) The round wheel drivers use to control a car’s direction. D) When a vehicle drives very closely to the car in front of it. This second ESL driving vocabulary task is one where you are given a definition of a word in the question and need to decide which option (A-D) has the word that matches the given definition. Again you can click the button to get your score. 1) What is the meaning of the following definition: When many vehicles are in front of one another and move very slowly or are stopped? 2) What is the meaning of the following definition: An object with a picture or writing that is put beside or above the road for drivers to read or see? 3) What is the meaning of the following definition: A person who is walking close to or beside a road? 4) What is the meaning of the following definition: A very long road where vehicles drive at fast speeds. These roads are not inside a city center but are outside or beside a city? 5) What is the meaning of the following definition: A special place for pedestrians to cross a road? For the final ESL driving vocabulary task you need to decide which option (A-D) has the correct word that matches the pictures given below. To see the answers just click on the get score button.